Walking along a local Devon lane last summer I came across a striking black seeded umbel (see image) - An umbel is the flat topped inflorescence, like an upturned umbrella, characteristic of the umbellifers or carrot family. 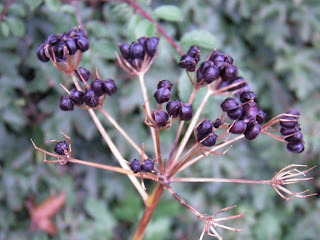 The black colouration, large size (up to 1cm) and angular ridges of these seeds was a good indicator that it was an Alexanders (Smyrnium olusatrum) plant. A sample of this structural plant architecture has contributed to an interesting display in our lounge, embellished at Christmas with a touch of glitter. 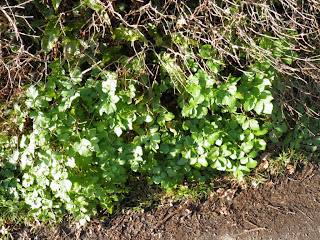 In the last few weeks I have observing the fresh green growth of the Alexanders celery scented leaves fighting the winter cold in many of the local hedgerows (see image). Alexanders seems to enjoy the slightly warmer climes of maritime and sub-maritime habitats such as many parts of Devon. 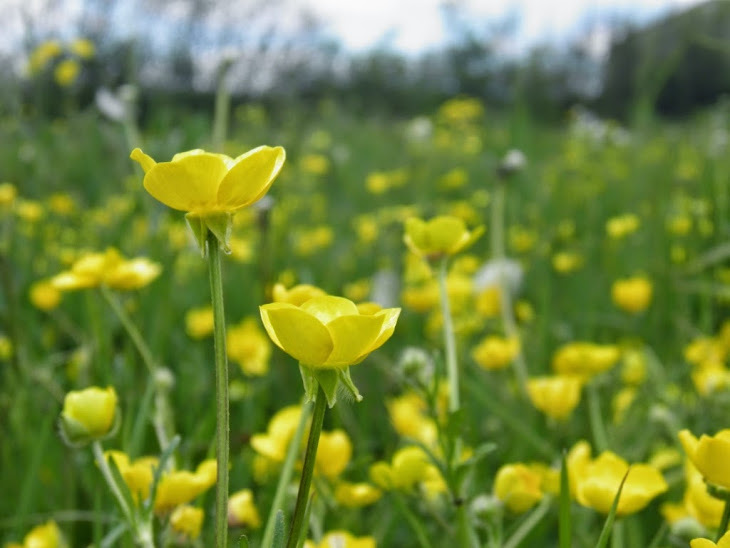 It was introduced by the Romans, but now fully naturalised in hedgerows, roadsides and on cliffs. The first written record in Britain was before 1562 when S. olusatrum was recorded “in Ilandes compassed about the se, as in a certain Iland, betwene the far parte of Somerset Shere and Wales” (Turner, 1562; cited in Randall, 2003). Its name possibly derives from the Italian and German denomination, Herba alexandrina having been supposed to have been brought from Alexandria in Egypt (Randall, 2003). Alexanders was a common pot-herb in kitchen gardens for many centuries, but fell out of favour in modern times. Today’s wild foragers however certainly do not turn up their nose at such a useful plant. Young leaves add a bit of ‘spice’ to salads, but most prized are blanched stems eaten like asparagus with melted butter and a dash of lime juice. For the more culinary adventurous you could try the wild tapas of ‘Spicy Alexanders in Hot Tomato Sauce’ using stems, or ‘Pickled Buds’ with their heavy scented flavour (Harford, 2011). Of course do make sure you are clear about your identification as there are a number of poisonous closely related species! Turner, W. ( 1562 ) A New Herbal. Pts 2 & 3. Arnold Birckman, London, UK.